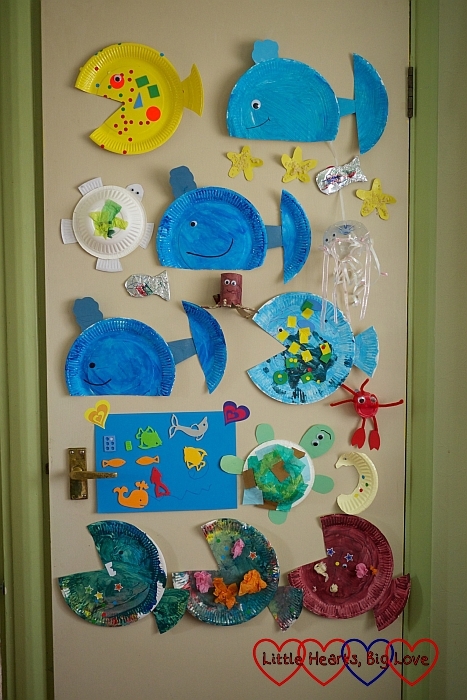 We’ve been focusing on sea-themed crafts over the past week, creating a variety of fish and other sea creatures out of paper plates, plastic cups and bottles and toilet roll tubes. 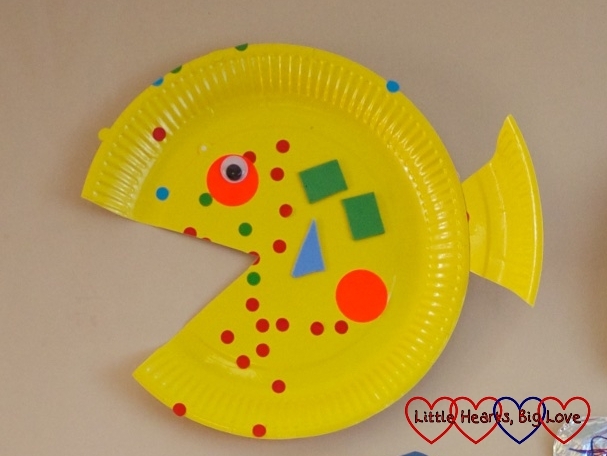 These crafts are perfect for preschoolers. Most of these have been quite easy to make, although one or two have required a little more extra adult help. The whale was made from a paper plate, with the bottom cut off to make the tail. We added a piece of cardboard for the bubbles coming out of the top of the whale. Another piece of cardboard was used to attach the whale’s tail. 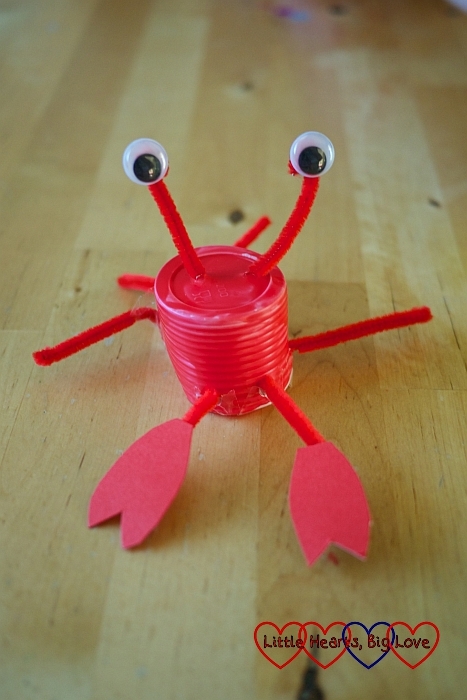 The crab was made from the bottom half of a plastic cup which had been painted red. We then punched some holes to pass pipe-cleaners through to make the crab’s legs and eyes and added googly eyes and cardboard claws. The turtle was made from a paper bowl with tissue paper squares glued on for the shell. We then added cardboard shapes for the flippers and head. 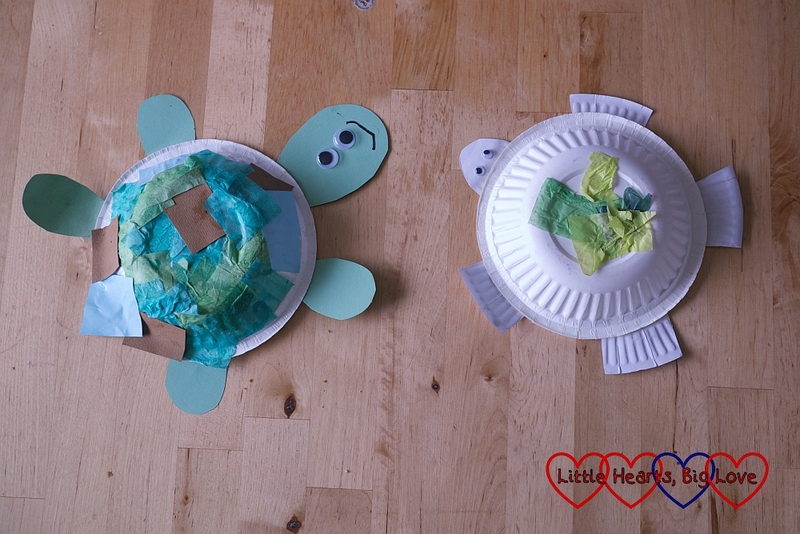 The second turtle’s flippers were cut out of another paper plate. The ridges of the paper plate look quite effective. You could also paint the bowl green before adding the tissue paper. 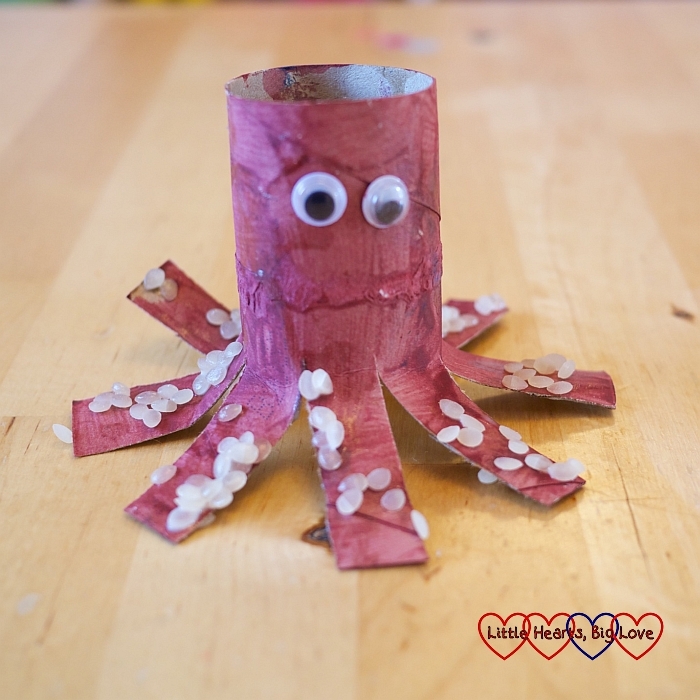 The octopus was made from a toilet roll tube. The tube was painted first. We then made vertical cuts in the bottom half to form the tentacles. Finally, we glued orzo pasta shapes on to the tentacles to finish off the octopus. Rice or lentils would also work quite well here too. We made two different types of fish for our sea themed crafts. 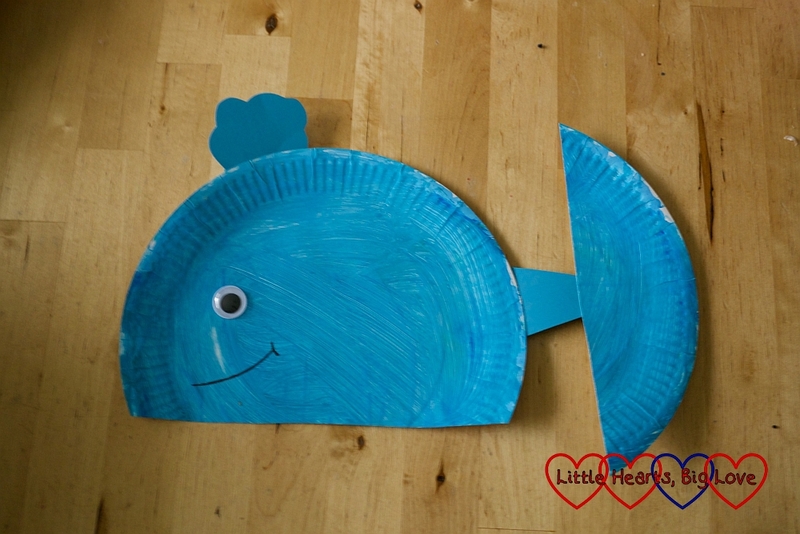 The paper plate fish have a triangle shape cut out which was then attached to make the fish’s tail. These were very easy to make. We made a few of these. Some were made using coloured plates, others with painted ones. We also added stickers, tissue paper or crayon scribbles to decorate our fish. 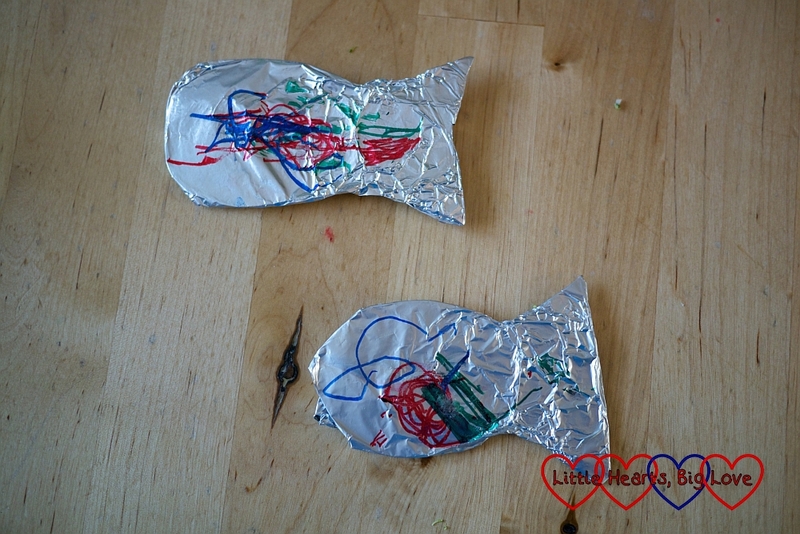 The other fish were made through cutting out cardboard fish shapes which were covered with kitchen foil. These were then decorated using coloured marker pens. 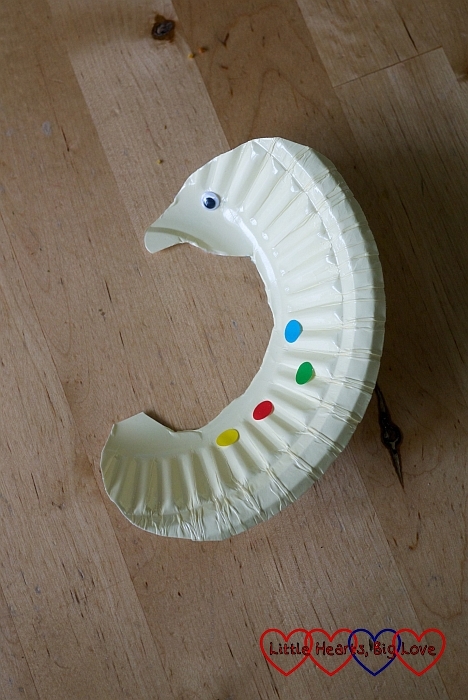 The seahorse was created by cutting a seahorse shape out of a paper bowl (using the ridges to form the spine of the seahorse) and then adding a googly eye and stickers to decorate. 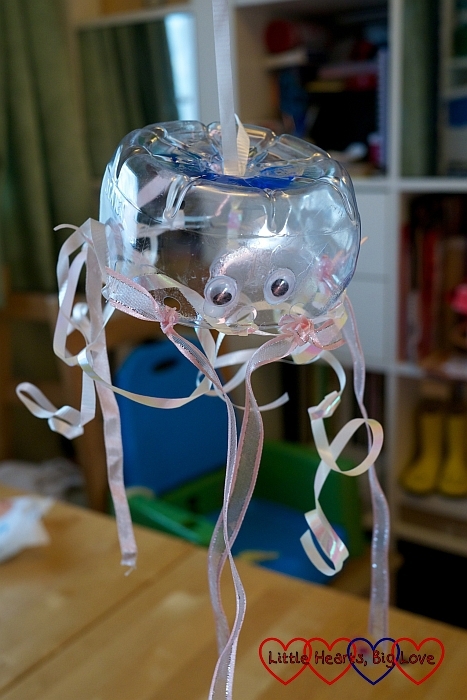 The jellyfish is made from cutting off the bottom of a clear plastic bottle. I then punched holes in it for threading ribbons through. Jessica found it very fiddly to thread the ribbons through though. She needed a lot of help from Mummy to make this one. You could substitute the ribbons for pipe cleaners which would simpler for little hands. The starfish were made by cutting out starfish shapes out of yellow cardboard and gluing on orzo pasta shapes. 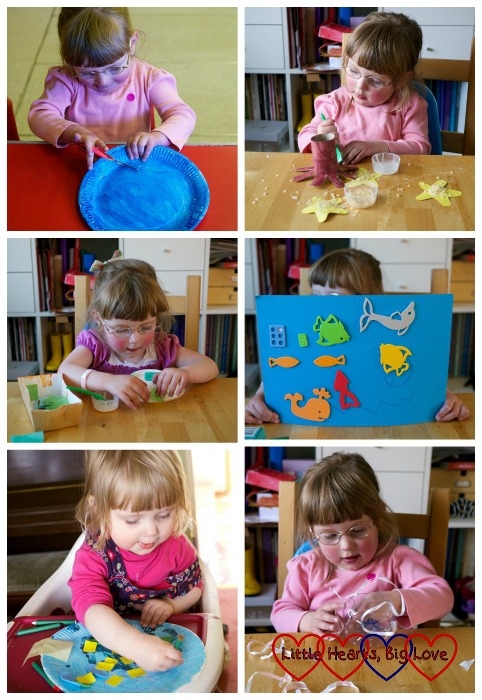 Both Jessica and Sophie had a lot of fun creating various sea creatures. Whilst Mummy’s help was needed with cutting out shapes, the girls could do most of the gluing and decorating themselves. Jessica also enjoyed creating a sea picture using foam shapes. It was fun having a theme for our crafts across the week. 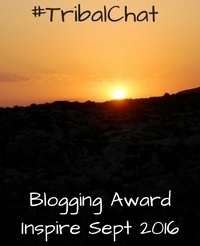 This is definitely something that I’d like to try doing more often. These look amazing!! 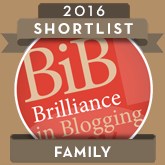 Well done, they are beautiful! 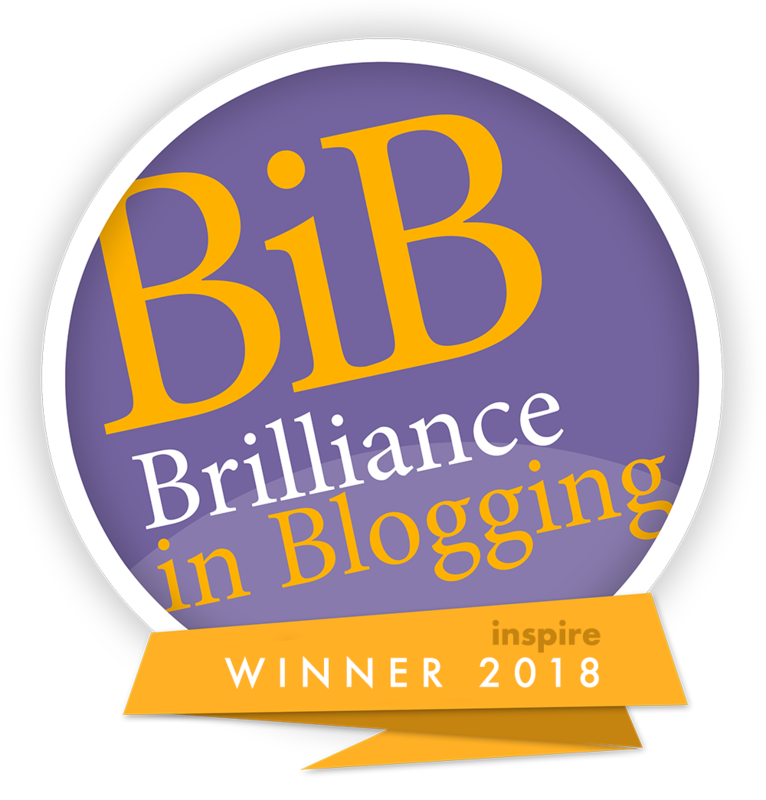 Thanks for linking up to #imaginationmatters and I look forward to seeing if you have anything for the “Summer” theme next week! These are great! We made fish and an octopus family recently, in fact the octopus one is written up and scheduled 🙂 Love the jelly fish and the crab! How fun! I love the display…that is the nursery nurse and preschool teacher coming out of me!!! !